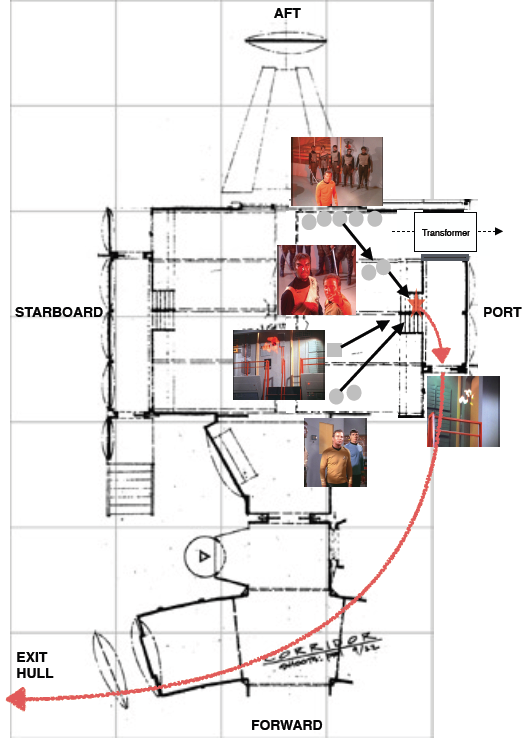 If you map out the possible angles of from all the combatants' eyes in Engineering, plus the possible location of the camera angle, the *entity is floating about 7-8 feet off the deck about 2-3 feet in front of the ladder that is on the normally hidden other side of Engineering. I have it crudely mapped out on my computer. I envision a rotated exact duplicate of the normally visible side. Note: no EMM in this room. The EMM must be in another room. Also, the pipe structure faces to the front of the ship. Probably located center line of ship secondary hull forward toward the deflector dish. Maybe it is the deflector dish and saucer systems energizer. Please join in on the discussions. Galileo7, Spocko and ZapBrannigan like this. Regarding the lines of sight, it seems like the director had the actors facing the wrong way. although I never noticed it while watching the show. The Klingons must have moved the dynamo out of the way to give them some fighting room. Could it have been pushed tightly up against the wall or consoles out of camera frame? - maybe, but it certainly went someplace. 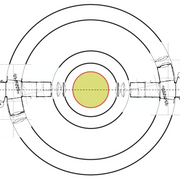 There could be a passageway against the pipe wall to bring the dynamo things to and from engineering. The consoles and walkway at that end would need to be eliminated. I think there's room for that. If the entity was located on the normal left hand side of the set, then the SPX team would have to put it in all the fighting scenes. That may be expensive and take a long time in post production. With the entity either behind or above the camera, it could be simulated with a red light on a pole while shooting; no SPX issues. The SPX created was mostly stationary with no people in frame. Maybe the director was trying to be clever at introduce something new. 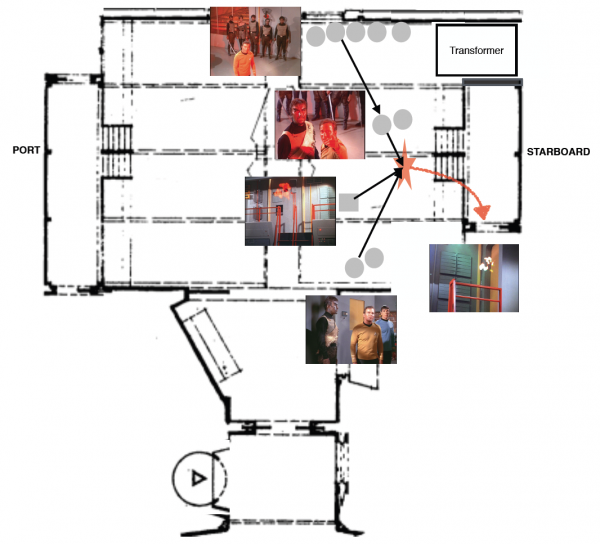 I think the director envisioned the same equipment as on the other side of the engine room (it would be cheaper to use the same wall instead of building a new set piece); just as I sketched it. Based on how it was framed, it might have been a shorter segment of the wall, but I tried to fit the EMM and the segment shown but it just doesn't fit and give the proper angles. The EMM may not have considered by him; continuity in the engine room may have not been high priority, or they intentionally meant to have more than one engine room. Like you, when I viewed it when I was younger, I thought nothing about it. Somewhere in reruns I got confused by the orientation of the scene. My sketch explains about 90% of visuals. The only thing I squint at is the path the entity takes while leaving the engine room. The SPX simply shows it moving sideways thru the yellow door, then popping out of the starboard side of the ship. 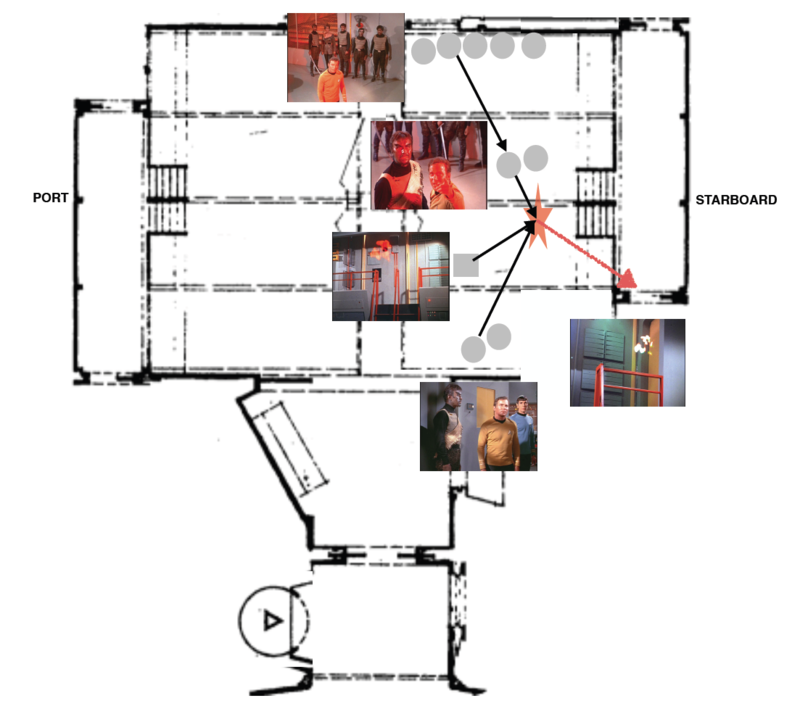 I've seen other interpretations with a short walkway segment on the corridor side and the EMM on the righthand wall, but it does match up as well with the proper angles, especially when Kirk/Spock are at the wall communicator. The engine room is flipped back so the pipes are going to the stern (that's good). Then the entity moves sideways crossing most of engineering from right to left to get out of the ship which is a little wonky. It does give one universal engine room (that's good). I really wasn't looking to hijack the other thread for a discussion: I just answered the two questions posed. "How did DotD imply a second ladder?" and "Can you see the diagram?" And to answer the third question, posed in the other thread, your forward bulkhead is my aft one. I thought about dragging down the stairs and walkway a little bit to make more room for the Transformer pass thru and a longer walkway aft of the ladder. I think we need blssdwlf or Donny to get beyond my crude sketches. Put two Engine Rooms in Secondary Hull. One is forward (Day of the Dove) and one is aft (with EMM). The center yellow circle is the same as on the bottom of the hull; I'd call it a maintenance area above an antimatter pod chamber. The outer circle corridor won't fit in the hull (unless you have a big ship), it is only there for reference purposes. To fit, it will need to get cut off on the top and bottom in the sketch. 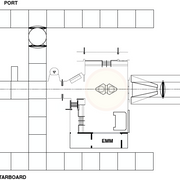 Aft of the right Engine Room would be the Flight Deck/Hangar Bay. Put two Engine Rooms in Secondary Hull. One is forward (Day of the Dove) and one is aft (with EMM). Which I can live with. [QUOTE="Henoch, post: 12777432, member: 77209"
blssdwlf and JonnyQuest037 like this. I think we need blssdwlf or Donny to get beyond my crude sketches. He's got the eye and the tools. I read that post, but kind of forgot since it was some time ago. A revisit is nice, sometimes. I think he missed the mark on the Day of the Dove Engine Room layout. Kang would be standing inside the console near the ladder. I guess the console and walkway above it could be recessed back a few feet. I'll try a simple layout with Entity movements. Give a little time. Here's what I whipped out. I moved the new fwd console and walkway back into the wall and I had to move it a couple of feet port to match a short wall segment as in the photo evidence. I also moved the EMM back port the same distance. His design allows one Engine Room does all. blssdwlf, Spocko and BK613 like this. I had my port and starboard mixed up, but I fixed it in the post via edit after you viewed it, but nothing else changed. I liked that he pulled the engine room forward in the hull. Two problems: don't we see the EMM earlier when the Klingons seize Engineering? I'm pretty sure we do as some of them jump down from it to attack. So where did it go? Second, given the dialogue about the 400 crewmen being trapped "below decks," and Sickbay, the Transporter Room, some sort of Environmental Engineering facility and the Armory all being above that point - since Kirk and the others can reach them - I can't see how Engineering is in the secondary hull. Yes, you can posit that the entity sealed a ton of other doors down in the secondary hull and nevertheless left the way to Engineering open, but that's not very satisfying. I vastly prefer either one engine room in the primary hull or two, one in each hull, and the dialogue in DotD seems to support that. I realize that the entity pops out of the secondary hull at the end. I think they came in on the normally seen left side as you walk thru the door. They hop down from that catwalk. No EMM in any of the scenes, thus my original intent to have two engine rooms. So far, I've provided a pipe forward, pipe aft, both with one with EMM and one without, and lastly, blssdwlf's pipe aft one stop shopping. I'm still taking requests. I realize that the entity pops out of the secondary hull at the end. Yah, kind of final on where it is. I think it's fine to put it (or one or two) in the saucer (too). 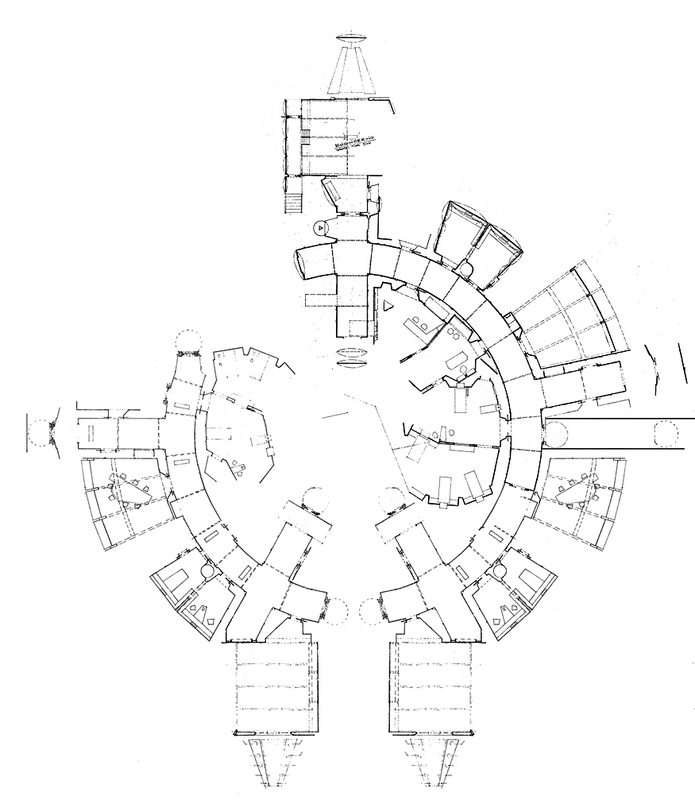 For saucer placement, the sketch below shows circles that represent the center of the saucer. That last sketch is great, Henoch. I want to make sure I understand - the sketch represents a primary hull version? The scale of the circles is throwing me off. Can you maybe add a circle (maybe with dotted line?) showing the full circumference of the saucer? First I'd need to pick a size of the Enterprise (which I'm avoiding so far), then I'd need to have the skill to insert it at the right scale. Based on general size and height of the Engine Room, it has to be near the center deck levels of the saucer to fit, off the main corridor (not in the rim or the undercut), maybe offset from the impulse engines (to allow passage of the turbolift). I'm too incompetent for such maneuvers. I'm just stealing pieces from blssdwlf's work TOS Enterprise WIP, Shaw's work Another fan attempt at TOS deck plans, and Mytran's work (plus others). I'm just adding some circles and squares that look good. I haven't measured anything, so, things are not to scale. Sorry. I recommend that any newish member needs to dig through some of these old threads on TOS Enterprise Design. Their work is fantastic. I like the idea of one Season 1 Engine Control Room in the saucer. It's purpose is to: control the impulse engines; connect power from the impulse engines into the ship power grid (probably EPS); and distribute power to the ship systems. It also distributes power from the engineering hull's main power up thru the dorsal neck. Most of the controls and consoles are for power management; like a big switching yard for the ship. 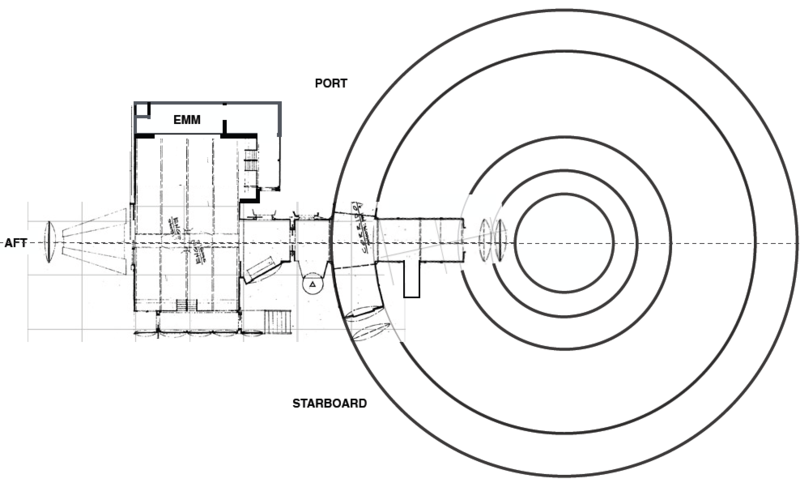 I've seen sketches with both one and two such Engine Control Rooms at the rear of the saucer. I'd prefer only one Engine Control Room in the saucer. Two is redundant even though two are symmetric and cool. I'd also like the idea that the Engineering Section Department offices are located around this area. I'm okay with one Main Engineering Room in the Engineering Hull. It's purpose is to control the warp engines; connect power from the warp engines into the ship power grid; and distribute power to the secondary hull systems and send power up to the saucer. Controls and consoles are about evenly divided into warp engine controls, M/AM reactor controls and power management especially from the dilithium crystal converter assembly into the main energizers to distribute main power power to the ship. Both engine rooms have back up controls so one engine room can take limited control of the other room. Limited control usually involves shutting down base functions and rerouting them to the other room. blssdwlf, BK613 and Phaser Two like this. ^430 likes for the above. Exactly what I would want too! There are too many references in dialogue throughout the series IMO (some of which admittedly require some interpretation) to have Engineering only down in the secondary hull. And sorry, didn't mean to give you homework. I wasn't sure how you were making the diagrams. Your text-based answer was just as good to give me the needed sense of scale. I'm still kicking around the idea that the engine room (just in the secondary hull) should be turned 180 degrees. In one scene, everyone on the bridge is thrown backward, but in the EMM, Scott is thrown away from the pipes, so, the pipes might be forward. I could technobabble it away, such as the inertial dampeners were set up to give a slight under correction in the saucer, and the engineering hull is set up to give a slight over correction, thus, throwing Scott in the opposite direction. Too wonky even for me. I also think the big red-lined, yellow circle on the bottom of hull should be significant. That is were I put the antimatter pod with dilithium crystal converter assembly at the top of the pod. I hope there is enough room between the pipe structure and the deflector dish mechanisms. Here's a very crude concept. Envision the side corridors conforming to the inside of the hull. 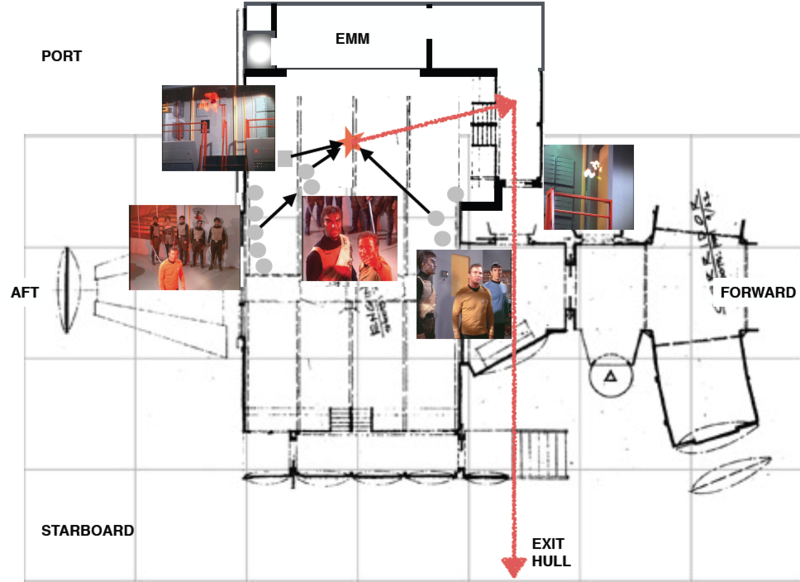 These will be observation corridors. By moving the Engine Room forward and rotating it, it frees a lot of space for the cargo hold, shuttle maintenance, etc. The whole subject of the Engine Room(s) in TOS is still one ripe for new speculation, even after all these years. Since I try to incorporate the curved corridors into my version of the Enterprise whenever possible, the long walk to the Engine Room in Ultimate Computer would also be best fitted into the saucer but this time facing forward. This would line them up with the 3 circular windows AKA the secondary deflector system, which in turn would draw a lot of power for M5 to tap in to. This approach (and the @blssdwlf design you've adopted) is not too far out of synch with my own thoughts, which have the various Engine Rooms as control centres rather than monitoring stations planted right on top of gigantic antimatter reactors. As such, they can be located a safe distance away from whatever terrifying energies actually propel the ship. This also means that the Engine Room(s) in the secondary hull can face either forward or back without a problem. Given what a tough job the main deflector has to do, perhaps a dedicated ECR would not be out of order? JonnyQuest037, blssdwlf and Henoch like this.